REMEMBER WHEN YOU THOUGHT YOU COULDN’T DO IT. WHEN YOU WERE TOO NERVOUS, TOO TIMID, TOO SCARED. THIS WAS NOT FOR YOU. YOU WANTED TO BACK OUT. BUT YOU DIDN’T. YOU TOOK A DEEP BREATH AND STEPPED FORWARD. BECAUSE IF YOU CAN DO THIS, YOU CAN DO ANYTHING.Home of the World’s First and most famous of leaps, this 43m (141ft) Bungy Jump is still the most popular Bungy site attracting thousands of thrill-seekers every year. Attached by your feet, you can choose to bob above the water, touch it or be fully dunked. Also unique at the Kawarau Bridge Bungy, you can share the thrill, it’s the only place in Queenstown where you can Tandem Bungy! The Kawarau Bungy Centre is FREE to visit so bring your support entourage too!SAFETY COMES FIRST – ALWAYS The Bungy originals, we’ve been doing this stuff for 30 years and our crew is the most experienced in the world. We were the first to be awarded an ‘S’ mark for exceptional safety, and safety is at the heart of everything we do. THE FACTS • HEIGHT 43 METRES (141ft) • WORLD’S FIRST COMMERCIAL BUNGY JUMP • WATER TOUCH OPTION • TANDEM JUMPS • FREE SPECTATORS If you've heard of Bungy, you've heard of Kawarau - home to the original 43-metre Bungy Jump. The world's first and most infamous of leaps is still going strong, with tens of thousands Bungying each year.At the world's best-loved Bungy site, you can choose from a number of options; topple over backwards, forwards, with another person, spin or somersault. 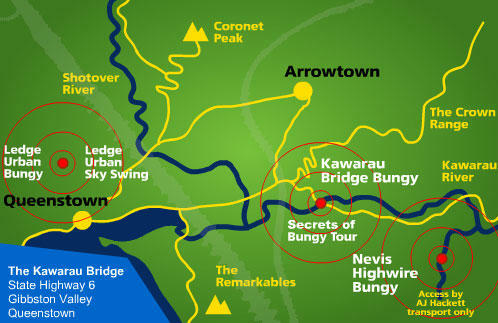 Kawarau Bridge Bungy is also the only Bungy in Queenstown where you can choose to bob above the water, touch it, or be fully immersed. "Physically, no harm will come to the jumper. The system is very gentle on a person who jumps. You can be a big strong guy or a little wee girl or a paraplegic or a very old person - it's no problem to jump all these people because the thing about Bungy is that it's from the shoulders up not the shoulders down & so it's inside your head. "Not feeling brave enough to take the plunge? No need to miss out altogether, you can join the excitement as a spectator and watch your friends bungy from Kawarau Bridge.